“I know it has to be around here somewhere”, you mumble while desperately rummaging through your desk, the filing cabinet, the book case, the storage compartments, and the twenty other places you stash things in the classroom. The teacher who asked for the papers is waiting, her foot begins tapping, and apparently something is wrong with her watch as she keeps looking at it and sighing. Yes! You finally remember putting the unit on Clouds and Weather in the filing cabinet but is it filed under “C”, “W” or “M” for meteorology? As you are digging through the files, sweat beads on your upper lip, that one annoying hair escapes from your ponytail and dangles in front of your eyes, and as you furiously flip past papers, you realize you filed it under “S” for sky. This happens more often than you would like to admit. Why? The answer is simple: you are a teacher. Teachers have more paperwork, games, writing implements, paper, books, plans, books on plans, stickers, and arts accessories than two craft stores and a Target combined. Fear not, you are definitely not alone in this quandary. While some people are blessed with the innate knowledge of how to organize their daily events, spice racks, or shoe trees, many of us have to be taught or shown how to do so. While there are many ideas on how to organize, the act of organizing is a very personal endeavor. There is not a “one size fits all” implementation plan for managing classroom materials, students, or lesson plans, and much of it is trial and error. I remember as a first time teacher how excited I was to make the room mine. I was finally a teacher! Then I entered my first room, looked around, and had no idea where to start. As an educator, your personality is going to shine through your room. If you are a messier individual, it should be no surprise if your room is cluttered, too. The same applies to those with a more simplistic view of organization. If you are a messier person that wants to be more organized, the following tips may be a help to you. The easiest place to start is from within. You need to feel comfortable in your classroom. If you aren’t pleased with your surroundings, chances are the students will not be either. Start with something easy, like your desk. The first thing you will need to work on is your own work area. This is the hub of the classroom, and needs to be organized to your liking. Position your desk so you can see the classroom, and try to keep the items on your desk to a minimum. You want to model good managing skills for the students. If Tommy has a messy area, he can look to your desk for ideas on how to keep his clean. You also want to keep a space to grade papers, work with students, or just somewhere safe to set down your coffee. You can find small bins that hold a few pencils, to large bins that can hold a few first graders, at most department or home improvement stores. Utilize these for the inside of your desk, especially the drawer in the front that holds the little things. Only put what you truly need in the desk drawers. All too often the desk, both top and insides can become a garbage dump of sorts for anything and everything. After some time a teacher is going to accumulate gifts, mementos, teddy bears, and coffee mugs from their students. The temptation to showcase these on the desk is a difficult one to resist. Check with the school administration before pulling out the electric drill, but wall mounted shelves (built or bought) save a lot of space in the classroom, and keeps your trophies out of the way of curious hands. 4. Make Your Substitute Teacher Folder A.S.A.P. I was a teacher at my son’s school seven years ago. The very first day of school on a Monday, my little 4th grader got hurt on the playground and horribly broke his wrist. Due to the nature of the injury, I could not return to school until Thursday. Imagine, as a teacher, missing almost the whole first week of classes. I had never anticipated such a crisis to happen and had no substitute teacher folder, and that poor lady really had to wing it those few days. Since then, I made the folder before the first day of school, just in case. As a former substitute teacher, nothing compares to the panic felt upon walking into a room with no folder or guidance. The folder is a “two-fer”; it not only helps the substitute immensely, it saves valuable time for the teacher to not have to scramble each time a substitute is needed. The McGraw-Hill company has great forms for teachers to help organize the substitute’s day. It is no secret that a routine is the best course of action when it comes to managing and organizing the classroom. 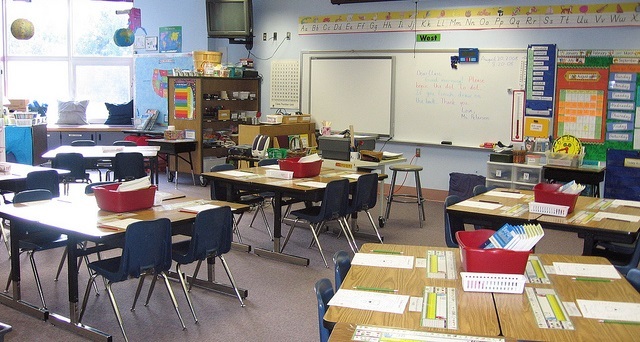 The first day of school is when the routines begin, but you need to know before schools starts how you want the room to run. You have many able-bodied and willing students that want to help, so enlist them. They can help put things away, clean up areas, throw away garbage, and wipe the boards clean. If you are teaching art or classes where you do crafts or paint use hanging drying racks. These help immensely in keeping the room neat along with keeping the projects safe. It also ensures the paint will dry evenly. If you use mason jars for canning, do not throw them away. They can be used in many different ways. They can be used to store wet (or dry) paint brushes, markers, broken crayons, or anything else you find to throw in the jar. Make sure to keep the lids so they can be stored on their sides. Empty potato chip tubes, such as Pringles, are great to keep around also. They can hold bulletin board border, calendar numbers and shapes, bows, and stickers. These are handy if you need containers with lids. Getting the students lined up quickly and efficiently is not as easy as it seems. There are squabbles over who gets to stand next to Tammy, who gets to be first, or even who is last. Nip this in the bud the first morning of school by giving each child a number or a letter. You can also tape either to the floor where you want your line to be so the students know exactly where to stand. This is also helpful to the younger students to help them learn their numbers, or their alphabet. These numbers can also be used for posting grades while keeping a bit of anonymity. Rather than pass out papers to the students all day, or try to ensure they receive important notes, invest in a mailbox for the classroom. You can use the students’ numbers on the tabs to keep them organized. Assigning numbers or letters to each child is also handy in case a student leaves, or one is gained. Rather than try to re-alphabetize the mailboxes, just add another number or letter. This also helps the teacher know at the end of the day who did not take their paperwork home with them. Using craft sticks or popsicle sticks, you can easily and fairly pick students to do tasks in the classroom. Rather than rely on raised hands, you can let the class know you will be picking sticks instead. This gives the more shy students a chance to shine, and the more outgoing students time to listen to others. You can number the sticks with the same numbers in the classroom, or you can add a different color to each end of the stick and flip it over when that student has had their turn. You can also allow students to pick sticks, thus ending the temptation to pick a friend. Many school systems want lesson plans turned in to the administrator before the start of the next week. When doing your plans, use color coded folders to help keep track of your days. For instance, blue is for Monday, green for Tuesday, and so forth. In each folder you can have the day’s plans, worksheets, ideas, or anything else that is needed for the day, right at your fingertips. Make extra copies of worksheets, too, because someone will invariably lose theirs within four minutes of receiving one. Folders will also help a substitute teacher work through her day. Crates work in many different capacities in the classroom. They can be used to hold folders, books, crafts, and paperwork. They can be stacked to save space and then flipped over to use as chairs. Austin, Texas music teacher Susan Rozanc uses them to organize her music for different ensembles. If a student forgets his music, they can go to the crate for a copy of the piece. While you want to trust your little darlings with your materials, it is best to assume the worst case scenario – you will never see your books again. A library sign out sheet is a must if you want to keep a hold of your books. The students sign a book out, and cannot have another until that book is brought back. If you do not already have some jars, enlist friends to save theirs for you. Baby food jars are great for holding small items such as tacks, paper clips, staples, or erasers. They are also good for small craft projects or flipped over to teach younger ones to trace circles. When you file items in a cabinet, drawer, desk, or bin, take the time to write down where you placed it. Using an Excel spreadsheet can help you do this. Label your column A as “item”, then columns B and so on are where the item might be found. In the number one spot, for example, write: “Weather lesson plans”. Put an X in the box under the column of where to find it. The last column title should be labeled “notes” so you can mark specifics, such as “placed under C for Clouds”. You can list your items more than once in case you forget what you labeled it, and in Excel alphabetize it each time you add something in order to find it quickly. Do not throw away any 6 pack holders you may use. These can be doctored up with wrapping paper, contact paper, or tissue paper to be used for storage in the classroom. These can be used to keep markers, pencils, pens, and crayons handy for students. 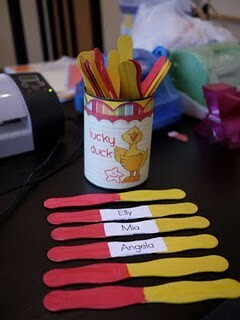 Great for craft centers, or even make one per child to have at their desk instead of pencil boxes. In order to keep a good flow to your lesson plans, it is a good idea to section the school books into fourths. Once you have done that, divide the number of pages by weeks in a quarter. This way you will know how much material is needed to get through for each quarter so you can finish the book. This is also a good way to get to know the book, or if you have already used it, to remind yourself what worked and did not work with previous classes. Index cards are an invaluable source of organizing help in the classroom. These, along with an alphabetized insert, will enable you to keep track of students’ birthdays, phone numbers, addresses, emails, best to time call their parents, and their allergies if they have any. You can also keep track of their likes, dislikes, days absent, and what they succeed at doing. You can also take notes of what intervention they appear to need in order to discuss it with parents at conferences. Many children are visual learners, and it helps to write on the board what the day’s schedule entails. This will allow them to know what book needs to be ready at what time, and should help transitions be easier on everyone during the day. So, that probably made you laugh as we all know it is impossible to eliminate messes in the classroom, but you can make it easier on yourself and everyone with a few routines and imagination. Spreading germs is a huge issue in the classroom, and by having a table with Kleenex and hand sanitizer together, you can teach the children to clean up even if they just blew their little noses one time. Tying a ribbon around an empty box of tissues and a new one so they are together can give the students an instant waste basket for their tissues. You can also give each child their own empty Kleenex box to put under their desks, or attach a plastic baggie to the back of their chairs for their garbage. At the end of the day, they can dump them out, or throw them away, and hopefully that leaves you with less crumbs, dirt, pencil shavings, notebook paper edge crinkles, and dirty tissues. No, of course not! There is so much more to a teacher’s day that needs to be organized. The ideas presented here are what worked well for me as a teacher in the elementary grades. I had no idea of what I did not know when I became a teacher of all the little tiny daily things that go on in a classroom that need to be reinforced. Carrie Wible is an educator, writer, musician, and mother living in Northeast Ohio. She has a Bachelor of Arts degree in Music from Kent State University, a teaching certificate in grades 1-8 from Youngstown State University and a Masters in Teaching and Learning with Technology from Ashford University. Carrie has been teaching music lessons and has taught in the classroom for a combined total of 25 years. Connect with her @carriewible or +CarrieWible. Thank you, your write up on organize your classroom was great. I have been teaching for over 20 yrs and still dont have it together. I can say its clutter free, but still can’t master keeping file organizes. great refresher course. Thank you for reading, Pat!